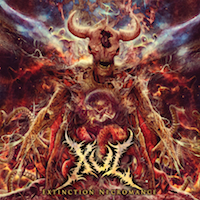 XUL is a 5-men Blackened Death Metal outfit from Canada and this is their EP following their 2012 debut “Malignance”. This is a four track EP and it clocks in at almost 30 minutes, and it might have been too much for me to digest. Firstly, the mastering is a bit flat through the album and it really made the song sound dry and empty. However, I really enjoyed it when the tempo slowed down in the first song and it became a more headbang-worthy beat. The guitars sound great: unrelenting throughout and great countermelody happening all the time. I love how pronounced the bass is in this album, it gives much needed depth to the album. The track ended in a really refreshing way; the last 15 seconds felt like a cinematic opening for the next track “Orbit of Nemesis”. “Orbit of Nemesis” was a perfect continuation to “Frozen, We Drown”. A gothic choir is accompanied with strings and medieval drumming before a death scream comes jumping at you and you are welcomed with blast beats and competing guitar lines. However, the idea was played longer than it should have and I found myself getting bored of the track. It would have been better if they condensed the idea and keep the brutality. The band has an interesting way of changing themes and style and they tend to do it suddenly which at times are on their favour as I was caught unexpected on many occasions. However, sometimes the changes felt forced and it didn’t gel with the rest of the track very well. My favourite moment is at the end of “Chaos Requiem” where the music was back to how it started at the beginning but stripped down with just acoustic guitar and bass and just enough fuzz to grime up the track. My biggest issue with this album is how similar the tracks feel. They all give similar vibes with similar composition style and melody, only the occasional guitar solo helps me differentiate one song from the next. It is like a steak with too much fats in it: Don’t get me wrong, it is good but a lot can be cut down to make the EP more concise and less draggy. This album has many memorable moments with sweet licks and groovy riffs, it is a pity it plays with certain ideas longer than they should. Hope to hear a more straightforward release from them.